Marketed as a suspense thriller or a psychological thriller, this film actually doesn't begin to fit either of these descriptions until well into the final act -- and even then, doesn't really achieve any significant measure of suspense at all. Best Actress Academy Award-winner Natalie Portman has only one scene that seems deserving of that recognition. 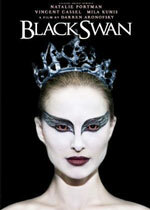 Read the full text of our review at Mr. E. Reviews Black Swan.